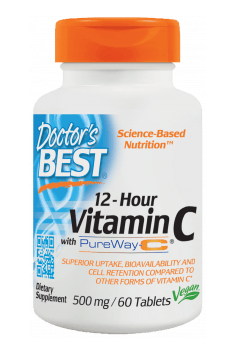 12-Hour Vitamin C 500mg 60 tab. The complex of compounds, promoting assimilability of ascorbic acid from this preparation allows to take the supplement regardless of meals (vitamin C is soluble in water, therefore there is no need to administer it along with a source of fat). In case of supplementing a higher dose, divide it into a few smaller portions, as it will decrease the risk of side effects in the digestive system.